Up until recently, the good folks at the Mysore Pinjarapole Society, a sanctuary for retired cows in southern India, had been faced with a serious theft problem. Each day, hordes of monkeys would wander from of a nearby forest to gorge on buckets of recently collected milk, the sanctuary's main source of revenue. Staff members tried their best to keep the marauders out, taking turns standing guard to shoo them away-but the milk-hungry monkey persisted undeterred. According to the New Indian Express, the Society had given up hope on solving the problem, but the perfect solution eventually appeared by accident. 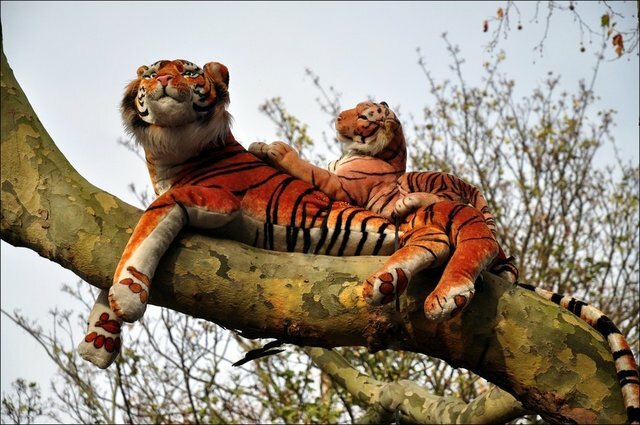 During a recent function on the sanctuary grounds, a life-sized toy tiger was put on display-that's when staffers noticed something remarkable: monkeys in retreat, chattering warnings as they hurried back into the forest. Apparently, the risk alone that that plush-looking predator might be the real-deal was enough to send the milk thieves in search of another meal. Afterwards, the sanctuary purchased two more toy tigers and placed them near their stores. "Since then, we have not seen a single monkey on our premises," says Society joint secretary S Ramesh Jain. "It is a big relief for us and our milk is safe." Throughout India, wild monkeys have become a growing problem, leading to unpleasant run-ins with humans in both rural regions as well as cities. Recently, the government announced plans to thin their numbers through sterilization and by lacing food with oral contraceptives. But if the Mysore Pinjarapole Society's serendipitous solution is employed more widely, it could prove to be an simpler and more humane way of easing tensions with local wildlife.